Click the button below to add the ITSM for DevOps - Drilldown Course to your wish list. This sixteen (16) hour course describes how to accelerate and modernize your IT service management (ITSM) processes in support of DevOps. Let’s face it, ITSM processes have – at times – a reputation for being heavy handed and bloated. They can also be a constraint in the IT value stream; particularly in organizations adopting Agile and DevOps practices. In this course you will practice and master pragmatic approaches for streamlining and automating existing ITSM processes and for handling compliance as code. Organizations adopting a DevOps culture and practices are able to deliver high-quality software faster. which means the business can deliver value to customers faster. You sometimes hear that DevOps and ITSM aren’t compatible. The reality is that high-performing organizations aren’t achieving success without ITSM processes.These organizations are performing ITSM processes. Those processes are just so streamlined and (often) automated that people don’t even realize that they are executing ITSM processes. This course discusses key ITSM processes that are critical to DevOps and how those processes MUST be adapted to achieve high performance and deliver business value. In an enterprise, DevOps doesn’t eliminate the need for controls and data. Regulatory controls and audits still exist and risks and impacts must still be managed. ITSM DevOps introduces ways to achieve both speed and control while driving value across the IT value stream. Class also includes GAME ON! An Interactive Learning Experience® and facilitated discussions and exercises that produce deliverables you can put to use immediately. Project Management Institute (PMI®) Professional Development Units: ITSM Academy is recognized by PMI as a Global R.E.P. Project Management Professionals earn 16 contact hours or PDUs upon completion of this course. As with all ITSM Academy training, our instructors have years of hands-on IT practitioner experience, enabling them to effectively intertwine theory and real life stories and scenarios. Using the highest quality content, this training style encourages active group participation, allowing all learners to bring from class a wealth of practical knowledge. Instructors for this course are Certified Process Design Engineers, hold multiple ITSM, DevOps and Agile Service Management Certifications and have completed ITSM Academy's Train-the-Trainer program. Instructor-Led Virtual Classroom: Log in with the instructor and the other students - no travel! A DevOps Institute Drill-down Course. 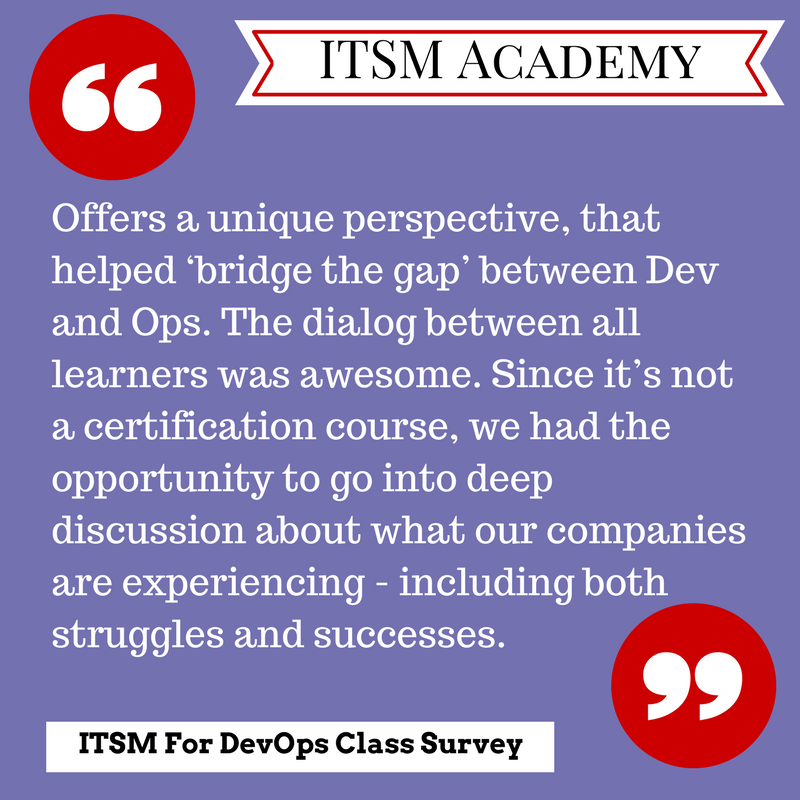 What sets ITSM Academy apart from other training organizations. With Chantell Smith, Director of Sales for ITSM Academy and Donna Knapp, Content Development Manager for ITSM Academy. 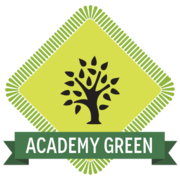 Why Choose ITSM Academy for Your Training? Maximize Your Investment in ITIL ...Make Your DevOps Teams Phenomenal! Having taken and delivered this offering, it is clear that it is the answer to retaining and maximizing the long term investments made in ITIL, while also maturing the DevOps movement in your company. One customer's long time Change Management Process owner has indicated that adopting some of the concepts learned here will greatly reduce the "60% time of herding cats" while still feeling confident that the company is protected and compliant to legal and regulatory requirments. Another Change Management Process owner, who previously sat DevOps Foundation indicated that this offering really complemented their previous DevOps learning ("made it make sense"). As a consultant, I am more enabled to speak and advise customers on what they might consider doing to get the greatest value from both (as well as other adopted frameworks and methods), based on their current level of maturity. We must keep learning how the integration of multiple 'pieces' can make us better service providers! ITSM for DevOps is an AWESOME CLASS !!! Loved, loved, loved it! And, of course, I’d be privileged to be able to be an approved as Instructor for ITSM for DevOps! Loved the interactions with other learners! This content is fabulous, well-organized, flowed very well and delivery was excellent! Loved the interactions with other learners! This course is “just enough” to guide learners how to change their ITSM processes to adapt to Agile, Lean, aka DevOps!!! People, Process, Products and Partners! AWESOME! I really liked this class; the discussion was great and it puts the two most popular drivers of IT transformation into perspective. The IT transformation journey is about making the whole greater than the sum of its parts, and combining ITSM and DevOps into a single class or workshop is spot-on. A great way to broaden people's understanding and take a fresh look at where you are and where you want to be. This course offers a unique perspective, that helps ‘bridge the gap’ between Dev and Ops teams. The dialog between all of us learners was awesome. Since it’s not a certification course, we had the opportunity to go into deep discussion about what companies are experiencing - including both struggles and successes. DevOps Foundation®, Certified Agile Service Manager (CASM)® and Certified Agile Process Owner (CAPO)® are registered marks of the DevOps Institute. BRMP® is a Registered Trade Mark of Business Relationship Management Institute, Inc.
ITIL® is a registered trade mark of AXELOS Limited, used under permission of AXELOS Limited. All rights reserved. The ITIL Accredited Training Organization is a trade mark of AXELOS Limited, used under permission of AXELOS Limited. All rights reserved. The Swirl logo™ is a registered trade mark of AXELOS Limited, used under permission of AXELOS Limited. All rights reserved. RESILIA™ is a trade mark of AXELOS Limited, used under permission of AXELOS Limited. All rights reserved.